This review of the United Concordia Health Insurance Company actually focuses on United Concordia Dental, a dental insurance provider. United Concordia Dental, a subsidiary of Highmark, has been in business more than 40 years. The company currently services more than eight million customers. Dental coverage is important, and so is general health protection! Put your zip code into the free toolbox above and then find a policy based on the health insurance quotes from major providers in your area! United Concordia Dental is available through employer’s benefits plans, as well as direct to the individual. The company is very focused on helping out in the community, and regularly sponsors free dental care clinics and other community support activities. Or you can call the company toll-free at 1-800-971-4191. Plans are available in 30 states. Policyholders can purchase coverage for themselves and/or their spouses and dependents. Children up to the age of 26 qualify as a dependent. Benefits range in coverage based on the policy chosen. To get coverage, policyholders must go to dentists that participate in United Concordia’s provider network. To find a dentist, you can use the “Find a Dentist” tab on the company’s website. The company also administers dental plans for employees, available to individuals as part of their job’s benefits package. United Concordia Dental has approximately 26,000 employer clients, including many Fortune 500 companies. 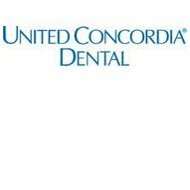 United Concordia has an extensive range of services available on its website, including general information about dental care, the company, and its policies. United Concordia Dental’s online “Dental Health Center” features everything from instructions on how to properly brush and floss your teeth to the benefits of cranberries for your teeth. The company has different online portals for members, employers, providers, and producers. As mentioned, United Concordia Dental sponsors free dental care clinics in underserved communities. By working with dentist and dental hygienist volunteers in its network, United Concordia was able to provide nearly $1.7 million of free dental care to those in need. Totaling 110 free days of dental care, the company helped 8,006 adults and children get the dental services they needed, at no cost to them. This care included x-rays, sealants, fillings, and cleanings, as well as education about the proper techniques for brushing and flossing correctly. This represented a huge growth over the year before, when 3,947 people benefited from 69 days of free dental care. United Concordia also monetarily supports Dentistry From the Heart, Mission of Mercy, and the National Military Family Association. The company administered 20 scholarships to minority and women dental students to help cover their tuition fees. Additionally, United Concordia helped community organizations through fundraising and volunteering. United Concordia Dental promises its employees a professional working environment, where job growth is achievable. The company has various openings at its headquarters in Harrisburg, Pennsylvania, as well as at its other regional offices. If you’re interested in job opportunities with United Concordia, click on the “Members” and then “Career Opportunities” links on its website. If interested, you can apply online, or call a member of the company’s “Talent Acquisition Team” at 1-866-722-9839. While you’re thinking about protecting your teeth, don’t forget about the rest of your body. Get health insurance rates right now by typing your zip code into the box below. We were paying $75/month and they didn’t tell us about the $50 deductible per person. So we suffer through that b/c 6 months in they say they will cover the bigger stuff. Guess what? Had $600 of work done and they paid $100. Do the math, they didn’t save me a penny. Total scam. Don’t waste your money on them!